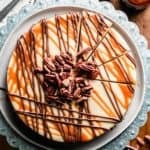 Gluten-free Turtle Cheesecake is cheesecake perfection. 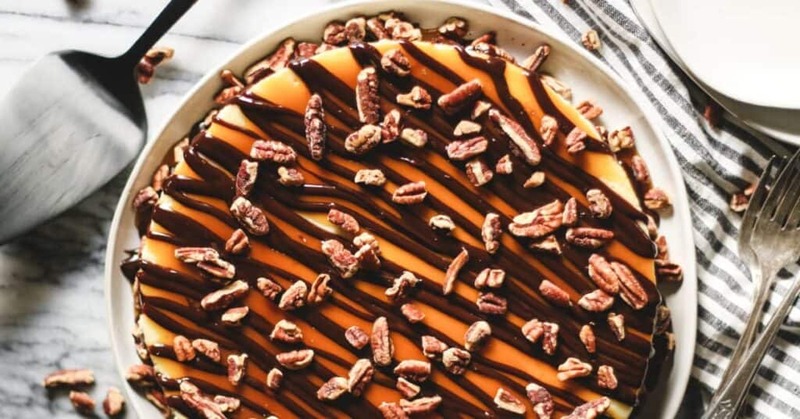 There is simply nothing better than caramel, fudge, and pecans on a creamy cheesecake. Making a cheesecake from scratch is probably not the easiest thing you could make. It’s a liiiitle bit of a process. But when broken down into steps, I’m confident any home baker can master the task. I made this turtle cheesecake, by request, for my son’s 18th birthday! I think it’s the best cheesecake I’ve ever made… and it’s gluten-free! It is a win-win! For the cheesecake filling, I basically followed Alton Brown’s Sour Cream Cheesecake recipe, because Alton very rarely disappoints and he didn’t this time either. The rest of this turtle cheesecake was my own creation! Come along with me and I’ll show you how to make it, step-by-step! 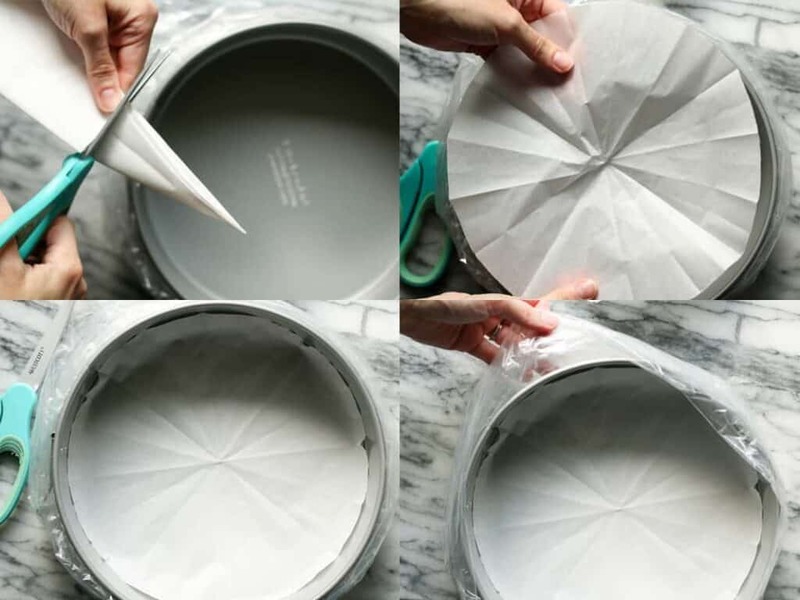 Cut a 9-inch circle of parchment paper to fit the bottom of a 9-inch springform pan. Spray the bottom of the pan with non-stick spray. Lay the parchment in the pan. Then spray non-stick spray on top of the parchment and on the sides of the pan. P.S. See that bag around the pan? You’ll see what we use it for later! Or… spoiler alert! I used Annie’s Gluten-free Cocoa & Vanilla Bunny Cookies for the crust. It was perfect! One box of cookies was just enough to make the crust for one 9-inch cheesecake. You could use gluten-free oreos, but you’ll have to remove the cream which seems kind of wasteful (to me)! Or use your favorite gluten-free graham cracker, I love Schar’s Honeygrams. But for this, I went bunny. The crust is super easy to make. Crunch up the cookies into crumbs, combine with melted butter, press into the pan. Pre-bake for 10 minutes. Next make the filling. You’ll need cream cheese, sugar, sour cream, whipping cream, eggs, and vanilla. The key is making sure the cream cheese is completely softened to room temperature. The other ingredients should also be at (or near) room temperature as well. This helps everything mix together smoothly without lumps. We don’t want lumps. First cream together the cream cheese and sugar. Then in a separate bowl, combine the eggs, sour cream, whipping cream and vanilla. Then mix the egg mixture into the cream cheese mixture. That’s it for the filling! Next we are going to pour the filling on top of the crust and prep for a water bath. A water bath involves baking the cake inside a larger pan that is filled with water. The warm water surrounding the sides of the cake while it cooks helps it to bake more evenly. See that bag surrounding the pan? That’s an oven bag! We’re going to use it to prevent the water bath from leaking! Put the springform pan in the oven bag. Put it all in a large roasting pan or any pan a few inches larger than the springform pan. Pour in boiling water about halfway up the sides of the springform pan, taking care not to get water in the bag or in the cheesecake. Then it all goes in the oven to bake. Remove the side from the spring form pan. Place a piece of parchment paper to cover the top of the cake. Then place a flat plate on top of the parchment. Remove the bottom of the pan from the cake and also the parchment paper from the crust. Place a serving plate on top of the inverted cake. Flip it all back over. The cake should now be right side up. 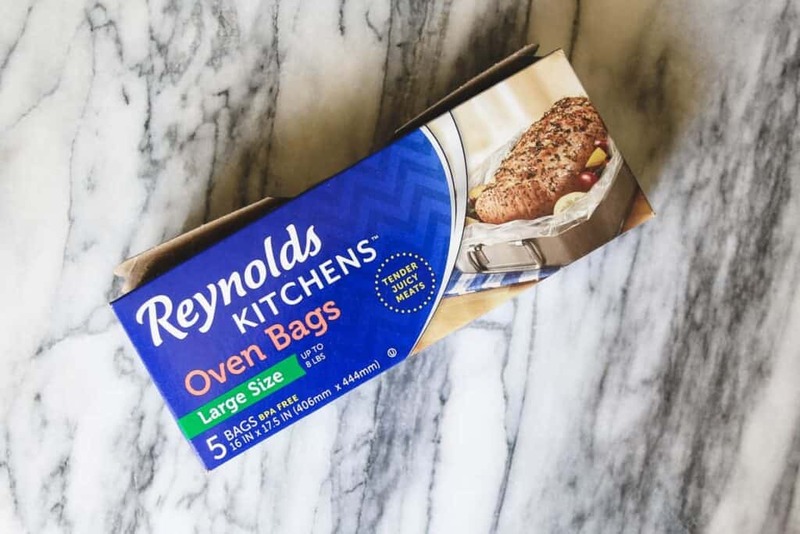 Remove the parchment paper… and voila! You are now the proud owner of a beautiful plain cheesecake! Now it gets really fun! 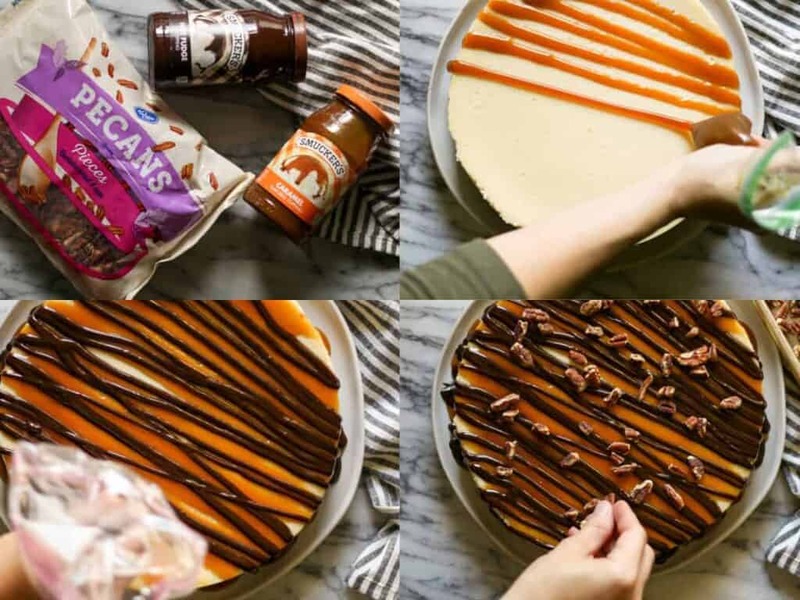 Drizzle the cheesecake with the caramel sauce and hot fudge sauce. If you want perfect drizzles, put each sauce into a plastic bag and snip the corner, making it into a little piping bag, then pipe the caramel and fudge on top of the cake. Lastly sprinkle with toasted pecan pieces on the top and sides. Then back in the fridge it goes! Keep it refrigerated until serving. Whew! That was kind of a lot. I know. But really, it’s not that difficult and the results are absolutely phenomenal! 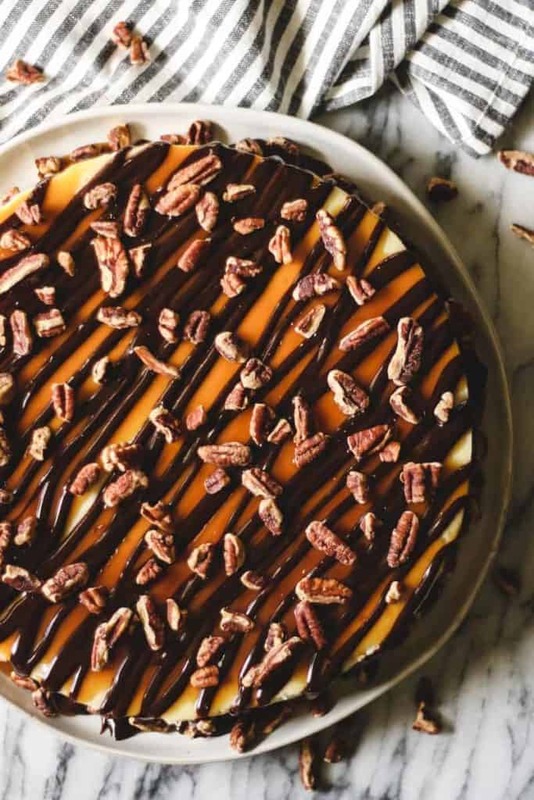 This turtle cheesecake is not only gorgeous, but it tastes great too! 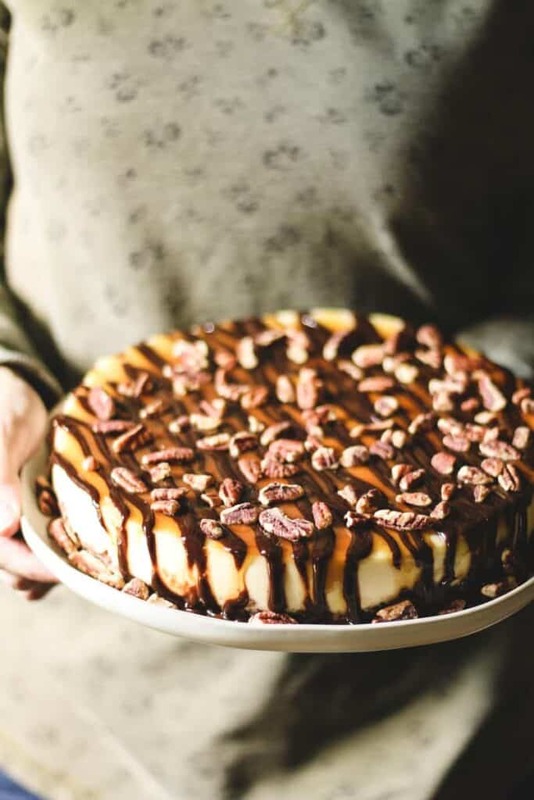 The perfect cheesecake topped with caramel, fudge, and toasted pecans. Spray the bottom of the pan with non-stick spray. Lay the parchment in the pan. Then spray non-stick spray on top of the parchment and on the sides of the pan. 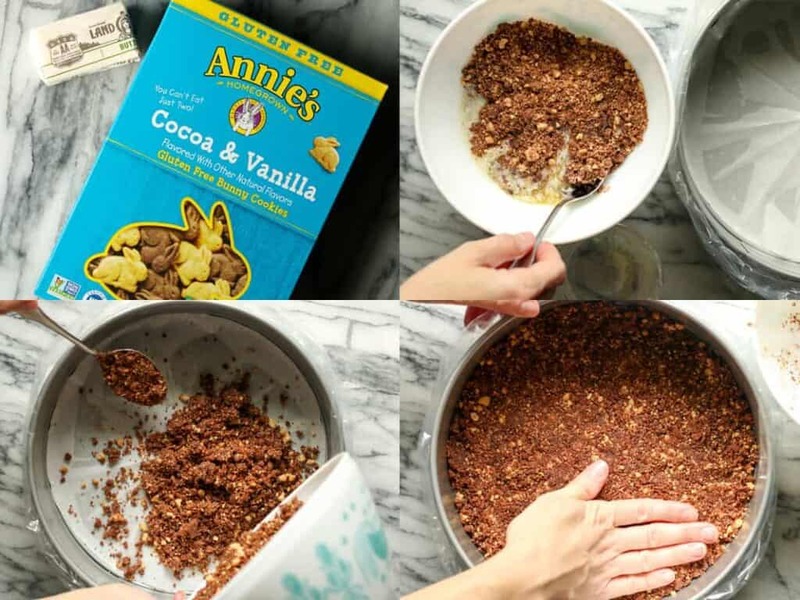 Use a food processor, rolling pin, or mallet to crush up the bunny cookies into crumbs. Put the crumbs in a small bowl. Melt the butter and pour it over the crumbs. Stir to combine the melted butter with the cookie crumbs. Pour the cookie crumb mixture into the prepared pan. Press the crumbs down into an even, compact layer. Put the crust in the oven and bake for 10 minutes. Then remove it from the oven and set aside to cool. 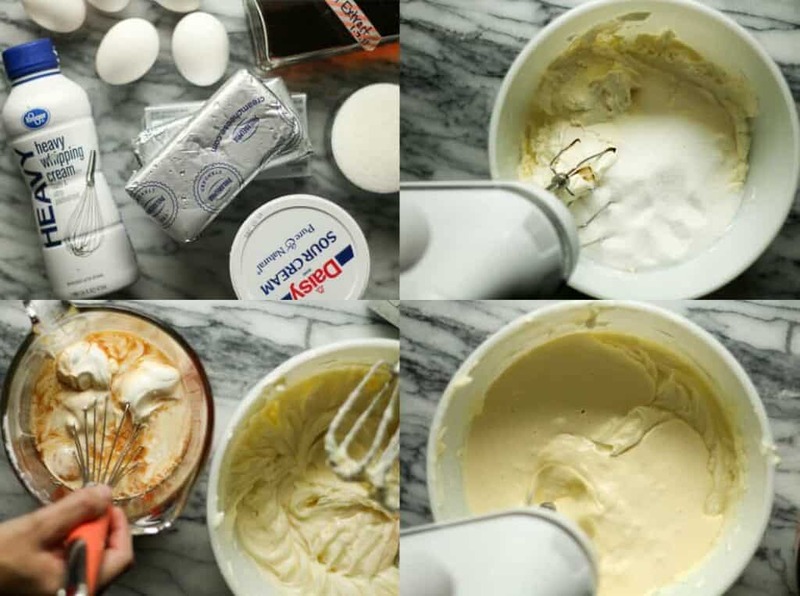 With an electric mixer, cream the softened cream cheese and sugar together in a large bowl until well combined. Scrape the sides and bottom of the bowl with a rubber spatula. In a separate small bowl, whisk together the eggs, whipping cream, sour cream, and vanilla. Pour half of the egg mixture into the cream cheese mixture and mix until well combined. Scrape the sides and bottom of the bowl. Pour in the other half of the egg mixture and mix until well combined. Scrape the bowl again. Set aside and prep the water bath. Boil about 4 cups of water. Put the springform pan with the pre-baked crust into a large oven bag. Pull the bag up to cover the sides of the pan. Carefully put the cheesecake into another larger pan, like a large roasting pan. Carefully set the large roasting pan with the cheesecake into the oven. Push the cheesecake off to the side to make room to pour in the boiling water. Pour the boiling water into the roasting pan, taking care not to get water into the bag or into the cheesecake. Fill until water is about halfway up the sides of the cheesecake pan. Carefully move the cheesecake back to the center of the roasting pan. Close the oven and reduce the temperature to 250°F. Bake for 1 1/2 hrs. Resist the urge to open the oven door while it is baking. Gather two plates: a flat plate and a serving plate large enough to hold the cheesecake. Run a knife or spatula around the side of the cake if it looks like it’s going to stick to the pan, then release the side of the springform pan. 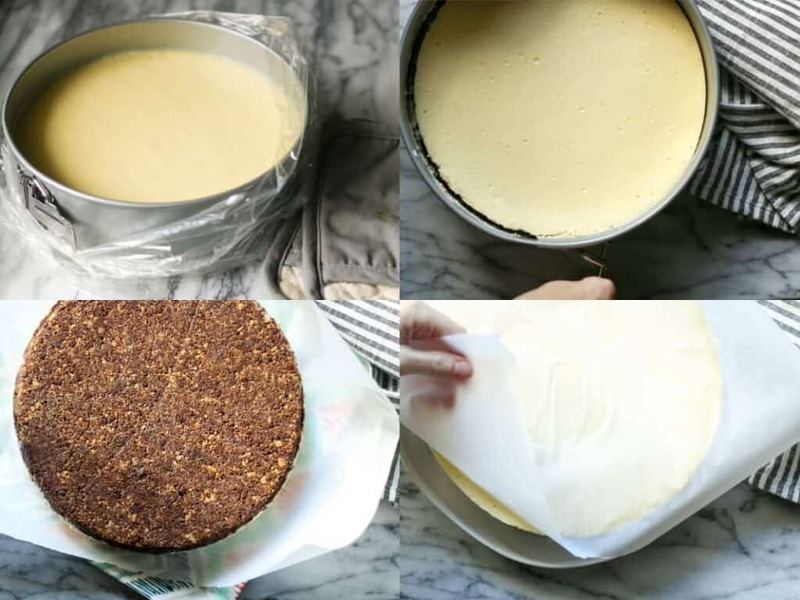 Place a piece of parchment paper, large enough to cover the top of the cheesecake, on top of the cheesecake. Take the flat plate and lay it on top of the cheesecake. Invert the cheesecake and set it down. Remove the bottom of the springform pan and then parchment paper from the crust. Place the serving plate on top of the crust and flip the cake back over. Remove the parchment from the top of the cake. Warm the fudge for a few seconds in the microwave so it will drizzle more easily. Sprinkle the top and sides of the cake with toasted pecan pieces. To toast pecans: Bake at 350 for about 10 minutes. This is probably the best cheesecake I’ve eaten! !